When businesses ask for a social media strategy, what they are often really asking for is: Get me a presence on Facebook, Twitter and the like. The mantra of cultural and organisational change that is required in the social web seems to ring hollow. To be fair, it is not their fault. With a traditional business mindset it is hard to see why a presence on Twitter or Facebook is different from the corporate website. After all, these tools can seem to be just another communication channel. When I talk to clients about the social web and its impact on businesses, I often use four key concepts. These concepts seem to help to explain the broader implications of social tools and why a mere presence on the social web will have a very limited business impact. In the good old days traditional businesses produced a product or service and the customer bought it. End of transaction. Over the years, they have distanced themselves from their customers. 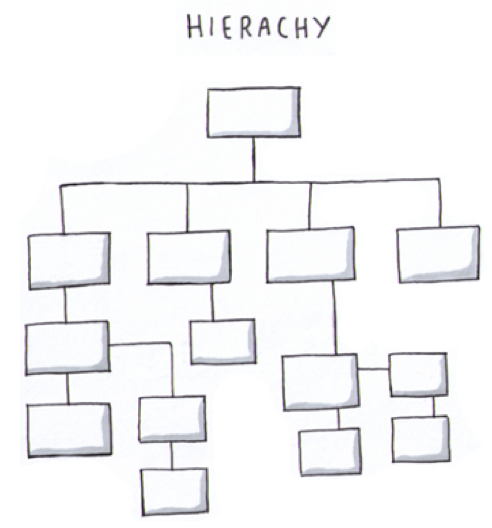 Traditional businesses live in their ivory tower from which they look down on their customers. They introduced call centres to shield themselves from customer complaints. Every so often, they introduce a new product and market it heavily using print and digital channels. Nowadays, they can also be found on Facebook and Twitter talking about their new product. They produce it, the customer buys it. End of transaction. 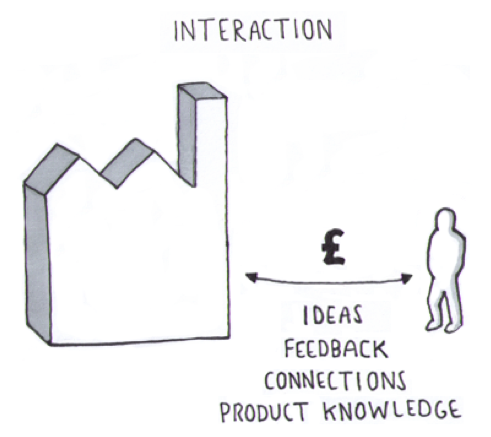 A social business however, is all about interaction. It sees itself on an equal footing with their customers. Of course, it still wants their money. After all it is a business and not a charity. But a social business listens to what its customers have to say. It is eager to get feedback, both positive and negative. Negative feedback is acknowledged and addressed in an honest and transparent way. 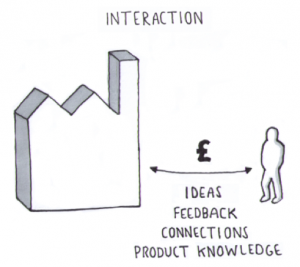 It sees it as an opportunity to co-create new products with the help of its customers. A social business operates in public and not from the heights of an ivory tower. A social business does not simply sell products, it sells customer experience. A customer of Zappos once tweeted that she had ordered shoes for her birthday. A customer representative got in touch with her asking about her order number just to make sure that the shoes would arrive on time for her birthday. You think that is difficult? Not for a social business. It is where its customers are and listens to what they have to say. It is all about interaction and customer experience. 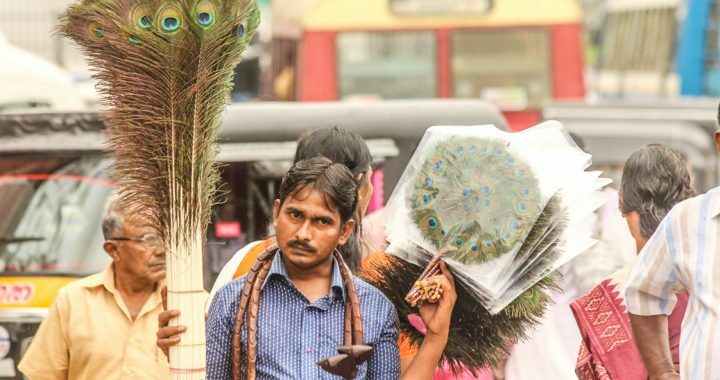 A traditional business has successfully created a wall between its customers and itself. Only particular departments are allowed to interact with the outside world, for example Marketing, HR, Customer Service. The rest of the business is shielded away from any external distraction to ensure employees are productive. Humans work in a traditional business. They have a face, but they can only show the company’s face. Sorry, company policy. Nowadays, traditional businesses have developed their own recruiting platforms. They also have a presence on Facebook, where HR advertise for new vacancies and post recruiting tips. They are really proud of this achievement. The traditional business can connect with potential recruits on Facebook. But actually, when they join they will see that Facebook is blocked. Sorry, company policy. A social business understands that people want to connect with people and not with businesses. If customers are looking for help, they want to talk to a real person, not a company. A social business acknowledges and is proud to employ many smart people not just in HR, Marketing or Customer Service. It employs them, because it trusts them. It wants the world to know about them and enables them to connect to the outside world. That is why social networks are open for everyone and people are still productive. 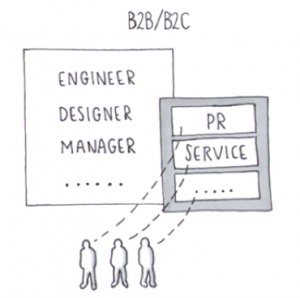 A social business manages by objectives, not by presence. Mary from the HR department posts new tips on Facebook, and not the HR department. A small but subtle difference. A highly talented engineering graduate asks on Facebook what life is like on an oil rig in the North Sea. Mary has never been on an oil rig, but she knows engineers who have. One engineer answers the question on Facebook, visible for everyone. It is John, not the company. People connect with people, not with companies. A traditional business clenches on to its old powers. It believes it still owns all the connections between customers and partners. If a partner would like to talk to another partner, he needs to go through the company. It manages in order to survive. According to a traditional business, shared knowledge is only worth half as much. Better to control the gates. A social businessunderstands that today’s technology enables anyone to connect with anyone, whether the business likes it or not. The gates are open. A social business knows if it simply keeps managing connections, it will survive, but if it facilitates connections it will thrive. Hence, it provides a platform for customers and / or partners. It is comfortable letting people discuss the business, its products or completely different matters. It facilitates and does not manage. Dell, a computer manufacturer runs a Facebook Page about Social Media for Business. Yes, Dell is not in the business of providing social media services. But it uses the group as a platform to stay connected with existing customers and potential customers. Dell provides more value than it can capture (in the beginning). That way, Dell stays in people’s minds. Dell may not always be the best choice, but I bet, the next time a member of the FB page is asked for computer advice by a friend, he will also mention Dell. A traditional business has a rigid top-down communication structure. News from the top is passed down through the ranks of the organisation. 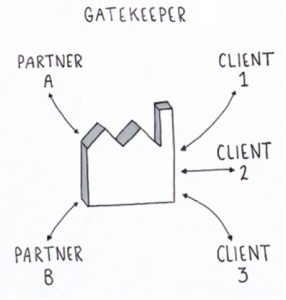 The middle management is powerful as it acts as gatekeeper (see above). Open and transparent dialogue between the top and the bottom of the traditional business is difficult if not non-existent. Furthermore, technology provision in traditional businesses have manifested in department silos. Few employees know what other departments or teams are working on. 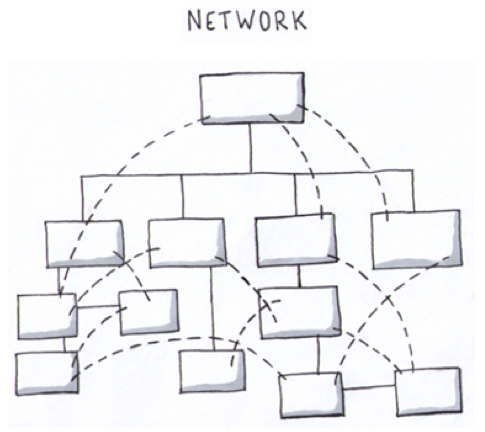 Cross-departmental connections are made in the cafeteria, at the water-cooler or in the smoker’s corner. 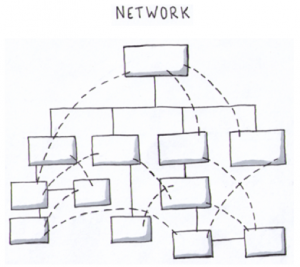 Contrary to popular belief hierarchy still exists in a social businessbut it is heavily supported by an underlying network. 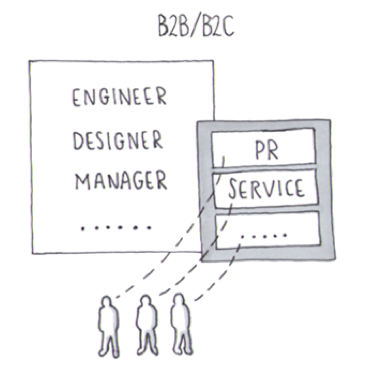 Communication flows are bi-directional and cross-departmental. 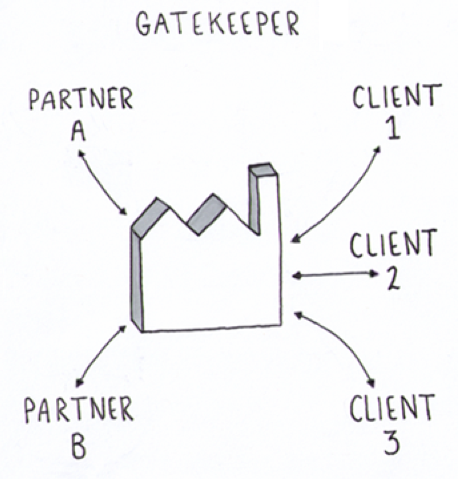 The middle management has lost its power as gatekeeper and is now functioning as platform provider. It provides a platform for the management and employees to communicate and connect. Employees can see what other teams and departments are working on. Increased visibility leads to better decision-making, improved customer service, superior products and ultimately higher sales. At the same time a social business also acknowledges that people connect with people not just because of work but also interests. Therefore, it encourages employees to form communities of interest or purely social groups. This creates stronger bonds between employees which leads to lower turn-over rates. If an employee does leave, they are more likely to stay in touch with colleagues, not the business. Remember, people connect with people, not with companies. 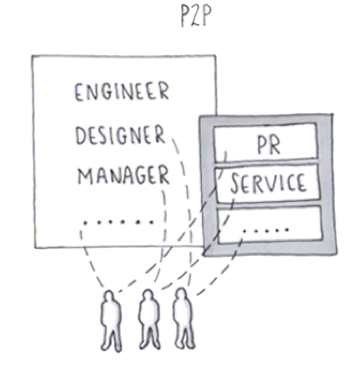 (see P2P concept). By now, many organisations have or are in the process of implementing a social business platform which enables employees to communicate with the senior management and also across teams and departments. Some of the most advanced and innovative organisations that have adopted this approach can be found in the Social Business Council. No doubt, more concepts exists. However, I believe many of them are part of the ones I have outlined above, i.e. From Control to Trust (B2B/B2C to P2P; From Transaction to Interaction), From Management to Open Leadership (From B2B/B2C to P2P; From Gatekeeper to Platform), From Employee to Brand Ambassador (From B2B/B2C to P2P; From Transaction to Interaction). If your social media strategy is all about setting up a social media presence, jump right in. It only takes a couple of minutes to set up accounts. There are gazillions of tips out there telling you how to increase your follower or “Like” counts. However, if your social media strategy is about business impact, you need to go back to basics. Understanding the key concepts and the broad impact of social tools on businesses, will help to deliver value. In the end, that is what business is all about, delivering value! The way organizations perceive their ‚human capital‘ has apparently changed as well. Most organizations state that they value their employees and welcome active participation. All too often this is in stark contrast to reality. To understand an organization’s true corporate culture it is sometimes best to simply look at the office layouts and technology provided to employees. How can you honestly believe in employee engagement and participation if you lock people into cubicle farms and give them tools that severely restrict them from communicating and connecting freely with each other? The cafeteria, hallway or watercooler are the only true social spaces in most organizations. That’s where people meet, discuss, learn. If the early KM era has taught us anything at all, then it’s that knowledge can’t be extracted, stored and archived. It was a flawed and in the end a very costly belief. Knowledge is inherently attached to people. Thus, instead of connecting people with documents, we need to connect people with people. And that’s why chatter in cafeterias, hallways and at watercoolers are so important. Check out Gil Yehuda’s observation why smokers seem to know everything and everyone. Obviously, these offline social spaces don’t scale very well. Social tools reflect better than traditional IT systems how humans really communicate and connect. With those kind of tools organizations do have the possibility to create the digital watercooler and thus take advantage of its benefits enterprise-wide. Installing social tools is not a challenge. The challenge are people and their perceived risks associated with the usage of those kind of tools. One of those risks for example is gossiping. Well, gossiping is actually an important social activity. It separates the insiders from the outsiders and by that creates a stronger social bond between insiders (thus all employees + management). But apart from that, will people gossip in front of the CEO? No? So, why would they gossip in an open space, where every word is attributable? People might gossip in the hallway, where they can have private conversations, but not on the company’s forum, blog, wiki or what have you. Another perceived risk is that the free flow of communication can be used for creating movements among employees against unfavorable decisions taken by the management. What a lot of people don’t understand is that internal systems are not the World Wild Web. It’s a controlled environment, and as such comes already with underlying norms and principles. Still, organizations seem to highly distrust their employees and prefer locking them into cubicles and systems willingly accepting the deficiencies of this approach. But the growing discrepancy between the open communication people enjoy on the Internet and the highly restrictive environment people are faced with at work is becoming a major headache for organization. In my presentation I talked about the case of the law firm Heller Ehrman. The firm got into very rough waters last year and subsequently dissolved. The dissolution did not happen over night. It was a long and painstaking process full of anxiety, fears but also glimmers of hope. Naturally, employees wanted to connect with each other, but most importantly ask for and provide help and support. But the firm did not provide a platform to address these needs. Consequently, one employee set up a WordPress blog on the Internet, which soon became a refuge for his co-workers and probably a nightmare for the firm. If you have time you should read the blog’s Dos and Don’ts – they show in a very plain and honest way that employees are not evil but passionate and caring individuals. If people really want to bad-mouth and spread rumor they will do so using highly visible websites and blogs like ‚Above the Law‚. Learning from this and other negative examples, progressive organizations are starting to embrace social tools to give people a true platform for engagement, communication and support. I presented the work that we did for the Barnet Council in London. The Council went through a major change management program to meet new needs and challenges. Rather than pushing it down from top to bottom, the Council felt that anyone in the organization should have the possibility to become a change agent and turned the communication upside-down. We installed a system which allows the Council to publish news, but at the same time have an open conversation about new developments. A forum provided the employees with a tool to drive their own agenda and points of interest. Interestingly, the system did allow for anonymity, but that functionality was very rarely used. Included in the platform was the ability to create ad-hoc project spaces to allow the collaboration on specific programs, issues etc. The technology aspect of the project was not a big challenge, but it did require a bold step by the Barnet Council, trust in its employees and understanding the changing tides in internal communications. This week I attended the Web 3.0 Conference in New York thanks to a ticket I won from Centernetworks. Even though I work in fields that are named Web 2.0, Enterprise 2.0, Government 2.0 and what not, it is always good to know where development goes. Besides, at university I took classes in computer linguistic, natural language processing and retrieval, intelligent computer agents. While I was never capable of diving into the technical matters, I was always very excited by the opportunities that those technologies would bring us one day. Looking for example at Wolfram|Alpha we are starting to get a taste of what machines will be capable of doing in the future. So, ignore the nomenclature of Web X.0 and imagine the Web as an ever evolving ecosystem, where players appear, change roles and vanish. In the mid and end 90s people were merely consumers of content that was thrown at them by media outlets and corporates. With the advent of social tools people changed roles and became content producers. Over the past seven years a massive amount of content has been created and is now dispersed around the Web. For example, people share reviews of books and movies on Facebook but that information is not available when they buy it at Amazon or Barnes & Nobles. People rate restaurants etc. on Yelp but that information is not at people’s fingertips when they accesse a restaurant’s website. Journalists produce content and have to manually link to resources on the Web. Thus, we have massive piles of data, but most of it is disconnected, tucked away in various services and applications that don’t talk to each other. Theory is great but what about practical examples? How can these technologies help to solve real-world business problems? Thomas Tague hit exactly on that point in his keynote. Technologists go nowhere if they don’t address business problems. Especially during these difficult economic times, businesses are forced to cut costs, increase revenue and competitiveness. He used the publishing industry as an example, which he sees as a zero-sum game and consequently businesses that adopt new (semantic) technologies can gain a decisive first-mover advantage. For example, the editorial workflow can be considerably reduced if the editor is automatically suggested links to bits & pieces mentioned in the text. Zemanta is a great example for providing that kind of technology. Another would be Apture, which allows editors to embed content from around the web and keep readers on their own website rather than sending them to Wikipedia, Flickr etc. Easily embedding 3rd party content will not only reduce time and cost but will also enhance the presented content and can therefore help to attract and keep audience. Another development is auatomatically enriching data with semantic metadata to improve findability and linking (e.g. Open Calais). Since the Web has become a platform we have come to understand that we need to make it dead simple to let other people use and interact with our content no matter where and when. Other examples? In the beginning I mentioned that it is not possible to see reviews of a book that your network shared with you on Facebook at the point of purchase, e.g. Amazon. That’s not entirely true, because Adaptive Blue offers a browser plugin called ‚Glue‘ which achieves exactly that. In this case every book is an object with a uniqe identifier and can therefore be querried from every corner of the Web. In the future you can imagine, that for example advertisers and brands can much better link the mentioning of a product by someone to the purchase of it by someone else leveraging the social graph. If you are in NYC on June 4, you should check out the next Semantic Web Meetup which looks at Semantic Advertising. Another example: Recently, Google introduced Rich Snippets. It enhances the summary text of the results after a user performed a search. If the users searches for a specific restaurant Rich Snippets will show the restaurant on a map, reviews from other users etc. Eventually the data that we have been creating around the web for the past years will come together and enhance our experience in ways we can’t even imagine yet. Mozilla calls it ‚the contextual web‘ and I think it’s a great name. 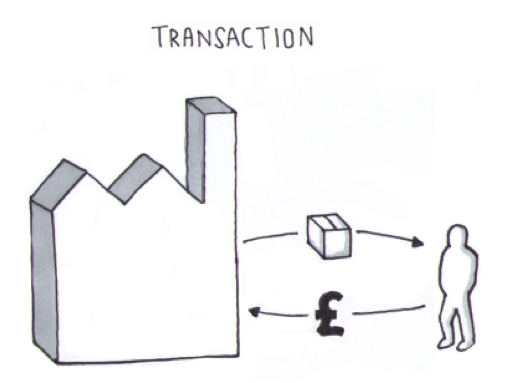 Objects and people will have more context and thus more value. There will be new possibilities, new business models and, yes, losers. I should dig out my old study notes, because the things that seemed to me science-fiction a couple of years ago, could become reality sooner rather than later. This is the 3rd part of a blog post looking at user adoption. Letting people engage with social tools using what they are already familiar with, seems to be paramount. If you are too prescriptive about the tools they need to use to interact with others or the tools themselves demand a certain type of interaction, you will lose a lot of people on the fence. Since a lot of people live in their inbox, we should be looking at ways to interact with a company’s wiki, blogs, forums, social network and even microblogging engine using an email client. I specifically say ‚email client‘, by which I mean not the ‚email inbox‘. The inbox should be for private information only. All other content (e.g. updates from blogs, wikis, newsletters, RSS feeds) should be received in different folders within the email client. Users should be able to post content to a blog using email. Products like Telligent, Movable Type cater for it already. The latest version of WordPress also allows to reply to comments via email. Three days ago Posterous, the ultra-simple blogging platform, announced a new feature which lets users interact with the platform without ever having to leave their email client. I would expect enterprise vendors to implement similar functionality in the future. Pretty much all wiki products allow users to subscribe to updates via email. But very few products allow users to post content to a wiki and even create wiki pages via email. Socialtext is one of them. However, as far as I am aware, Socialtext and other products do not allow users to directly edit content in an email client and sending it back to the wiki. A lot has been said about the use of RSS. While RSS for plumbing purposes has been widely accepted, standalone RSS feed readers are having difficulties to find their way into the enterprise. Primarily because most feed readers are fairly complex and expensive, but also because users don’t understand the difference between receiving their newsletters, updates in their email inbox and in a reader. For them it’s an additional destination they need to go to. Newsgator for example offers a plugin, which enables users to consume feeds in their email client. Since feeds are completely different than private conversations, they are displayed in separate folders and not in the inbox. Email is used to connect with other people, but so far most email clients don’t show context information about the recipients or senders of an email. It would be interesting to automatically have profile information, status updates, last actions from a sender or recipient of an email. This could work for a company’s internal social network but also with external networks like LinkedIn, Facebook using XOBNI or Gist or services like Jigsaw, Zoominfo, especially for sales people. CRM set out with the best motives but many CRM initiatives fail because of low user adoption, significant amounts of inaccurate data and a poor match between processes and technology. In the end, CRM is a top-down tool that works for managers who can get their salespeople to play the role of a data entry clerk in addition to selling and managing customer relationships. Companies should look at possibilities of exchanging data between email client and CRM systems. For example, scheduled meetings or to-do items are automatically transferred into the CRM system. Team members can view that information inside their email client before sending emails to clients. Twitter is all the rage at the moment and we are seeing very promising products appear in the enterprise space, e.g. Socialtext Signals, Yammer, Socialcast. For most people however, it is yet another application and destination they need to go to. Yammer allows to post and receive messages via email. Sometimes it is desirable to initiate an IM chat right after having received an email. For example, IBM’s Sametime IM technology plugs into MS Outlook indicating if a person is available for a chat/call and allowing the user to directly contact another person within the email client. As mentioned before, people use email to have conversations about non-confidential topics. In this case, it could be beneficial to the company if these conversations where accessible to other employees. But convincing them to use forums, blogs or wikis can be very difficult, as they are outside of their workflow. In its latest version Thoughtfarmer introduced a feature, which publishes content from an email distribution list to the wiki adding details like profile pictures, links to employee profiles. There it will be indexed and the information is accessible even if people leave the company. For example, working on wikis and blogs potentially exposes people’s work to the entire firm. Most people are uncomfortable with that idea. Furthermore, it can require considerable effort. Instead of implementing wikis and blogs from the start, it might actually be better to look at social bookmarking, social networking or social messaging (microblogging) first. The value/time investment ratio is usually better than for wikis and blogs. Look at social bookmarking: The workflow is not radically different from what people are used to. They can opt out of sharing on a case-by-case basis, learn how valuable tagging can be for themselves. At the same time they understand the value of transparency when searching/browsing colleague’s bookmarks instead of relying on the enterprise search engine. Early adopters and enthusiasts will be happy to work directly on the wiki, consume news and updates in their RSS feed reader and read and send messages directly in the microblogging engine. For the rest make sure that they have the possibility to use those new tools with something they are familiar with. If people find content (sources) interesting they should be able to decide how and when they want to receive content; let it be via email client, RSS reader, feeds on the team space, message on the microblogging engine, or PDF. Stop pushing content down people’s throat using email! This is nothing new, but I believe people have been rather ignorant to the fact that a lot of existing workflows involve email. Instead of simply implementing some new shiny tools, try to bridge the gap between the old and the new world. New behaviors will emerge, but it won’t happen over night. That’s why enthusiasts need to acknowledge that most skeptics will continue to follow the path of least resistance and reject tools that are not part of their workflow, are too difficult learn and use or don’t yield an immediate personal benefit. If you ignore that, the success of your Enterprise 2.0 initiative may be in danger and the skeptics may prevail in the end. This is the 2nd part of a blog post looking at user adoption. The first barrier (insufficient training) can be addressed fairly easily. The scope and content of the training program should depend on complexity, context and people’s background. Barriers two and three (culture and generation gap) are cited very frequently with respect to user adoption. Not to sound harsh, but I think the importance of these two barriers is partially overrated. This is not to say that they do no effect user adoption at all. But looking at cultural issues, people assume that certain behavior can be attributed to a particular culture and by that ignore other explanations. For example, a very common argument is that people are unwilling to share what they know. Well, they may not be necessarily unwilling to do so, but it does take low priority when people try to meet their goals and deadlines. That was the fallacy of the early KM era, in which employees were asked to step outside their work and ‚contribute‘ to a fancy KM tool (aka database). The beauty of social tools is it then, that they allow people to do their work in a more efficient manner, thus, gaining direct personal value and at the same time letting the organization as a whole benefit from it by breaking down silos and enhancing transparency. People need to realize that in most cases, knowledge-sharing is not an activity but in fact a by-product of people’s work. That’s why it is so important to implement these kind of tools into people’s workflow. On the generation gap, most of the statistics seem to indicate that the older generation is technology averse and few use social tools or services on the Internet. But what about LinkedIn with it’s 39 Million users? What about XING, where 37% of its users are baby boomers? What about Facebook, where the fastest growing demographic is women over 55? And if the younger generations are always on the lookout for the next cool thing, why is the average age of people on Twitter 31? Can we really explain all that just by looking at age, gender or race? I doubt it! Ultimately it comes down to value! People flock to a service from which they get value. What constitutes value, lays in the eye of the beholder. Therefore, it is paramount to understand people, their needs, interactions with others, current tools they are using and so on. This leaves us with the last three barriers (applications not part of user’s workflow, time effort > personal value, complex applications). To reach second-wave adopters we will need to concentrate on these barriers and come up with strategies to bridge the old and new world. The number of people can be visualized according to a bell-shaped curve. People on the edges, thus, group one and three, are usually in the minority, whereas group two constitutes the majority. Forget about the third group! Getting them into your yard will most probably be impossible and distract you from focusing on the people on the fence. Besides, the group is usually fairly small and may well leave the firm not too long into the future. The enthusiasts are also usually a small group, but a very important one. They can positively influence at least some of the people on the fence. As pointed out before, the skeptics are not opposed to social tools per se, but do need to understand how they can benefit most with the smallest effort to change existing practices. And that’s where Enterprise 2.0 projects fall dangerously short. Early adopters and enthusiasts tend to have their heads somewhere in the clouds and forget about the existing work practices of the masses. As much as we dislike it, people live in their inbox and this fact is not going away over night by telling them about the benefits of using social tools! Given the lack of appropriate tools in the past, people have grown accustomed to (ab)use email for everything, e.g. public conversations (e.g. cc’d), collaboration, awareness (e.g. newsletters, updates), connecting with others. It’s effortless to fire an email to a group of people rather than using a separate tool. And yes, for most people it is easier to use email for collaboration rather than a wiki, even though they are aware of the disadvantages. In the last part of this series we will be looking at ways to attract second-wave adopters of enterprise social tools. I decided to break this blog post down into three parts, as it had become way too long during all those endless nights of writing. The general theme is that in the near future we will see more companies starting Enterprise 2.0 projects to increase productivity, reduce cost, improve client relations. While we have seen some early success stories, companies will need to think hard about ways to attract second-wave adopters. While everyone is talking about social tools and services in the consumer market, things have been comparatively quiet in the enterprise market. Yes, there are very noteworthy case studies out there (Sun, Wachovia, TransUnion, and also some of our clients), but the number of initiatives and scale can’t stand up to the things happening in the consumer market. Millions of dollars have been spent on heavy enterprise systems that promised much but delivered little. Admitting failure is difficult, especially if people that commissioned the systems are still with the company. The promise that knowledge could be captured and stored was proven wrong but cost businesses millions of dollars. Anything coming along now promising better ‚knowledge-sharing‘ raises immediate suspicion. Gatekeepers seeing their position weakened. The focus on quantitative ROI, even though investment is relatively low compared to traditional enterprise systems and ROI figures for DMS, CMS, CRM systems were usually based on a coin flip rather than real figures. However, with the current economic climate, change is not optional anymore. Organizations need to address inefficiencies caused by outdated management ideas and inadequate technology to increase productivity, save costs and offer better service to existing and prospect clients. This is one of the reasons why I expect to see more and more social software projects starting over the next months. At that point we will talk more about the HOW and less about WHAT and WHY of social tools. But even if companies start exploring business social tools the question remains: Will people come if you build it? And more importantly, will they stay? User adoption is especially critical in E20 projects, because the tools become more valuable the more people actually use them. Therefore, user adoption must not be an afterthought but carefully thought of for from the start. Even though the training effort is relatively small compared to heavy and complex enterprise systems, handholding during the rollout is very important. Culture can be subdivided into personal and corporate culture, but both influence each other. People fearing disadvantages from the introduction of new tools will do everything to sabotage or avoid their usage. Baby boomers, Gen X and Y and Millennials adopt technology in different ways and interpret the world according to their own values and beliefs. Technology exists to help people to create value and do things more efficiently and effectively. If the technology does not support those processes, users will be reluctant to use it. People are pressured by deadlines, objectives and managers. If the tools do not help them to alleviate some of the pressure, they will stick to their current tools and processes ignoring their inefficiencies. Uptake will be low if applications require a lot of effort to learn and subsequently to use due to unnecessary complexity and lack of usability. In the following post we will have a closer look at each barrier. Over the past decades we have seen the world becoming smaller and smaller thanks to new technologies. Location has almost become irrelevant when it comes to communicating, collaborating and connecting with other people. If I want to see someone in a different place, I fire up the video chat. If I want to stay informed of what family and friends around the world are up to, I call them on the phone or tune into Facebook. If I want to know what people in my network find important at this very minute, I look at Twitter. And even in remote areas I can still stay connected using text messaging. Welcome to the ‚Global Village‚. And yet, it is the nature of our existence that we are (still) physically bound to a location. 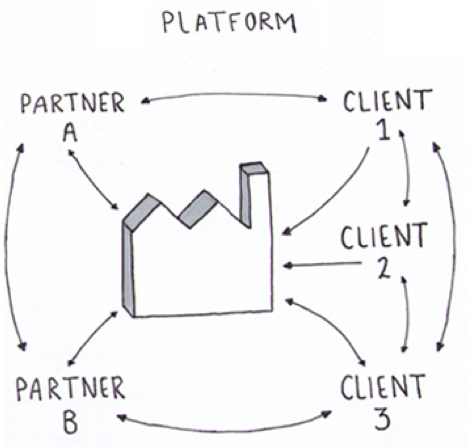 Through place and proximity we are all automatically part of another world – the ‚Local Village‚. Unlike back in the days though, we do not necessarily depend on the people living next door. We can perfectly survive without our neighbors thanks to all the modern amenities we are surrounded by. Thus, we may live in a local community but that does not mean that we are an active part of it. In one of his papers, Marcus Foth makes a great point by saying that „a lot of social encounters are based on serendipity and coincidence„. People meet in the hallway, when walking the dog or during other events. Often, conversations on such occasions are limited to a greeting or meaningless trivia. If you don’t have kids that sit in the same class as your neighbor’s kids or do not attend service at the local church, chances are high that you won’t have much of a connection with people living next door. It is fascinating, and depressing at the same time, that we are much better connected with people that we may not even have met in real life than to our next-door neighbors. Thus, the question becomes how we can re-instill a sense of community and belonging in the ‚local village‘ that we seem to have lost over the years. Can we find answers by looking at communities and networks of the ‚global village‘? Another interesting scenario could be the voting on how parts of the budget of a council are being spent. Councils should involve residents by giving them the opportunity to discuss how much money should go to certain areas and developments in their neighborhood. Not everyone may have time to go to meetings or feel comfortable discussing matters in public. An online platform could considerably extend the reach of offline meetings and inclusion of residents thanks to its convenience. A third example that is being talked about quite a lot is hyper-local news. People reporting from/about their neighborhood. Robin Hamman, former head of blogging at the BBC and now Headshift colleague, lives in St. Albans (UK) and writes a local blog. By publishing content on the internet, he found other bloggers from St. Albans and they have started meeting offline to discuss among others local matters. He recently wrote a short blog post about it. Of course, the motivation and means of writing and sustaining a blog might be limited to very few members of a local community. To ensure buy-in from the majority of residents it might be easiest to look for pain points and problems within the local community that people care about. Before one talks about any tools or applications, it is paramount to understand the residents and their needs, backgrounds, computer literacy etc. That’s what David Barrie does in his proposed high-level project plan for two of his community-building initiatives in Cardiff and Moscow. When I met him about a year ago, we discussed the role social tools could play in bringing residents of different communities together. I am very happy to see his initiative taking shape and will monitor it closely, especially to find out if the different cultures have any considerable impact on strategy, execution and outcome. The key advice I would give David as he starts the projects is to identify the real motivation and needs of (each) resident of the community during his investigation phase. „Improving flows and exchanges of experiences between people and existing groups“ is a noble vision, but unless you have devoted contributors like Robin in you community, the project might be off to a difficult start. I would assume that few people will start blogging or contributing to a wiki to get to know each other better or share experiences. In my opinion there needs to be a direct and easy-to-reach reward or something residents are truly passionate about to get them involved. Identifying that element is paramount. Most of the communication, collaboration and connecting will evolve around solving those problems and will ultimately help to re-instill the sense of a global village into the local village. Is the concept of blogging scalable? This blog post was originally published by me on the Headshift blog in 2009. It seems that there are only two topics people talk about these days . One is the economic turmoil and the other is the microblogging service Twitter. While there is unanimous consent that we are facing one of the worst economic situations after WWII, there is a heated debate going on about the usefulness of Twitter. Some simply love it while others can’t make sense of it viewing it as time-wasting and geeks‘ new toy. Despite the sarcasm of its numerous critics Twitter showed an impressive growth rate of 900% in the last year, and that’s only the usage of twitter.com. Double that traffic comes through the APIs, thus 3rd party applications. Some even suggested that Twitter could go mainstream soon, without actually defining what numbers needed to be reached to justify that statement. Fact is, microblogging is not simply a super cool form of communication (a la SMS speak of teenagers but for 18+ (average Tweeter is 31!)). It fills a real need for almost realtime communication. If you want to know what people are paying attention to at the moment, you use the Twitter search instead of Google. Next time a plane touches down on the Hudson River make sure you are watching your Twitter stream instead of waiting for images to appear on CNN. So, microblogging will not go away. Twitter could potentially disappear, but at the moment that seems rather unlikely, especially since Pownce (talent) was recently aquired by Six Apart and Google couldn’t figure out how to make Jaiku work and in the end giving the code base to the community. What I am trying to understand is if microblogging as it stands at the moment is actually scalable, not in terms of technology but behavior and usage. The biggest question mark I have is around the @ messages. Twitter was called superior to Email because you would only receive updates from people you choose to follow. Well, yes and no. This is certainly true for your overall friends update stream and Direct Messages. However, if you haven’t activated the setting ’show me only @ messages from people I follow‘, anyone can send you an @ message. There are people on Twitter that have thousands of followers and I assume they receive hundreds of @ messages. I have no clue how they cope with it, but I believe only few of us would put up with such flurry of messages. And how long will it take until someone creates a bot that listens to specific keywords and sends out @ messages to the people that used those keywords? Imagine you send out three tweets and receive nine spam @ messages. That may not seem severe but I think you get the idea. So, is the @ message functionality doomed once Twitter grows even more popular? Furthermore, Twitter applications will need to become much smarter to be still practical once it does hit mainstream. For example, I am thinking of the dozens of RTs, which go unfiltered at the moment. Threaded replies (yes, I do have the Greasemonkey script installed, but I am mostly using Tweetdeck) would make life much easier, especially if someone responds to a tweet a day later and you have forgotten about the original tweet. If you have a conversation with two people it would be great to simply reply to the thread and it goes automatically to both recipients. Or would that open the door to spamming and we would see a CC functionality in disguise? Abuse could become a significant issue for Twitter. We have seen that already happening, when Twitter accounts of high-profile people were hacked and sent out spam messages. Jeremiah Owyang fell vicitm to another spam spoof a couple of days ago, in which supposingly a bot created various Twitter accounts just changing one letter of his account and following thousands of people. Twitter is already plagued with spam followers, which is nothing serious but simply annoying. In the future another nuisance could be that spam twitter accounts are created en masse sending out messages to each other using specific keywords or hashtags. The more there are the more likely it is that the Twitter Search will be polluted with those messages. Openness can be a blessing and a curse at the same time. I am very curious to see how our behavior and usage will evolve with the growing popularity of microblogging and how technology will cater for those sorts of changes. Maybe I am just overly concerned and microblogging does scale. That’s for you to decide. I would be very interested in hearing your thoughts. Oh, and I am @christoph by the way. The New York Times published an article today on how utilities turn their customers green. For years and years the Sacramento Municipal Utility District had tried to push people to using less energy by offering for example rebates for energy-saving appliances. However, all tactics seemed to be in vain until they applied a very simple but effective principle – peer pressure. Last April, [the Sacramento Municipal Utility District] began sending out statements to 35,000 randomly selected customers, rating them on their energy use compared with that of neighbors in 100 homes of similar size that used the same heating fuel. The customers were also compared with the 20 neighbors who were especially efficient in saving energy. After about six months an assessment showed that people that had received personalized statements reduced their energy use by 2% more than the ones that had received a standard statement. Encouraged by these results the approach is now piloted in ten other major metropolitan areas. The results of this initiative seem to validate a study conducted by Dr. Robert Cialdini, a social psychologist at Arizona State University. The article mentions similar initiatives, for example at the Central College in Pella, Iowa, and in Massachusetts where towns are competing in a reality series, called „Energy Smackdown,“ which is shown on a local cable station. Most of these initiatives are locally. Using the power of the social web though, competitions can span the entire world and increase its impact considerably. Headshift has been involved in two green projects which are using peer pressure and competition as engagement models. Do the Green Thing is a fun and engaging way for people to tackle climate change. It’s based on the premise that simple actions done on scale can have a big impact. If you do a green action it is automatically communicated to your peers and wider network enticing them to do the same. The results speak for themselves. Within 18 months people were able to save as much as 5.86m kgs CO2. The other initiative has been set up by NESTA and is called ‚The BIG Green Challenge‚. NESTA put out a £1 million prize fund to come up with the best ideas to tackle climate change. Out of the 350 projects that entered, they are now down to the final ten. These ten communities have one year to implement their idea and prove its practicality and effectiveness to reduce carbon emission. By the way, our colleague, Robin Hamman, is currently traveling the country up and down to visit the finalists and bring them up to speed with social media, so that they can reach their audience. You should subscribe to the blog to get the latest info. It will be interesting to see where the competition leads us to. It has already spread awareness and unlocked the innovative potential of the people involved. Whatever is saved in terms of carbon footprint will simply add to the success of the project. Experience shows that notes one and two very rarely work. They reflect a very top-down approach. People are under a lot of pressure and therefore need to leave their altruistic spirit at home. They are concerned about getting their own work done and do not have time to think of others. And who could blame them? Financial incentives have been discussed widely. The general tenor on this is that the approach is flawed, as it can easily be abused and the initial effect wears off after some time. This leaves us with the the third note. Competition is unlikely to instigate the cheerful sharing of information. It’s more about reputation, thus intrinsic motivation. The more transparency there is across the organization to easily identify topic experts, the higher the motivation to become more visible. This in return means the person needs to engage with others and contribute through his work. It won’t be enough to brag about oneself. Reputation is based on one’s action and other people’s judgment. Will transparency be enough to kick start communication, collaboration and connections between employees? Surely not! Tools that increase transparency will need to be easy to use, embedded into peoples‘ work and make them more productive. You may want to think about whether your email client, your IT and Internal Comms driven intranet, proprietory DMS and CMS caters for that. Now let’s take a look outside the enterprise. With the advent of social tools customers have become increasingly deaf to brands‘ marketing messages and blind to their shiny advertisement. Customers want to be engaged. They want to feel part of the producer / consumer equation. The traditional model did not reflect that. Some brands have acknowledged this shift and are actively listening to and engaging with customers. By now there are a lot of brands that have set up a blog, Twitter account or Facebook fan page / group. But really, how many brand or product based FB groups / fan pages are out there and enjoy a large number of followers? Most of them are inactive or dead. That’s because there is nothing to engage them with (but also because of the shortcomings of FB). Competition, entertainment and education can be strong drivers for engagement if applied adequately. Playing games is such a fundamental part of our childhood (and beyond) that it is an easy way to engage people. Most games come with some sort of competition, which keeps people coming back. They can reveal things about ourselves that we didn’t know of, would rather like to hide or were not able to express. In the case of StyleHop retailers can show and sell their products. They receive genuine feedback and can identify upcoming trends, because it is based on data collected with the games. The girls on the other hand can see what is out there, receive better recommendations, can compete with their direct friends or even their network (e.g. university) or other networks. StyleHop is just an example. The principles at work here can be applied to other retailers, products, target audiences. The implementation though is the tricky part of it. We are all human beings. We love to be entertained, play games, compete with others. We have done that for thousands of years. The Internet is not going to change it. Instead we need to figure out how we can make use of it for a good cause or to thrive our business.